To make the chicken baked ziti, preheat oven to 375 degrees Fahrenheit. Cook the pasta al dente in a large stockpot of well-salted boiling according to package instructions. Drain. Return pasta to the stockpot and add chicken and alfredo sauce. Gently toss to combine until the pasta is evenly coated. 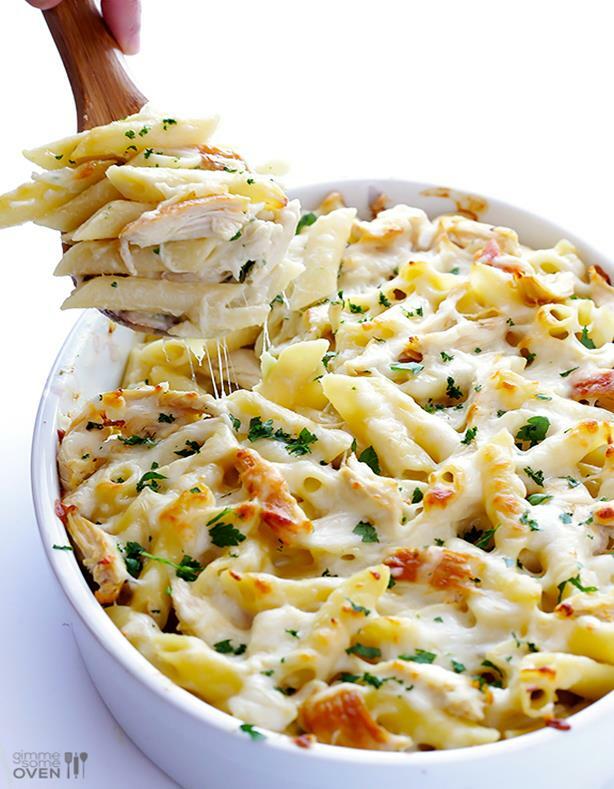 Pour half of the pasta into a greased 11×7-inch or 9×13-inch baking dish. Sprinkle evenly with 1 cup of cheese. Layer the remaining half of the pasta evenly on top. Sprinkle evenly with the remaining 1/2 cup of cheese. Bake for 20-25 minutes until the cheese is melted and just barely starts to turn golden. Remove and serve immediately, sprinkled with additional toppings if desired. To make the Alfredo Sauce, heat olive oil in a large sauté pan over medium-high heat. Add garlic and sauté one minute, stirring occasionally, until fragrant. Sprinkle with flour, and stir to combine. Sauté for an additional minute to cook the flour, stirring occasionally.